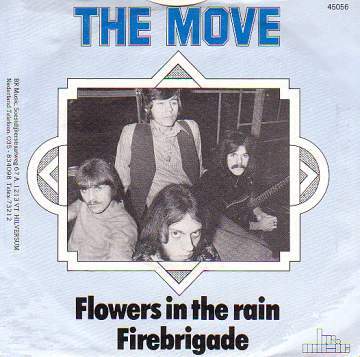 The Move, like the Moody Blues, were proof that Birmingham was part of the sixties beat boom along with Liverpool, Manchester, London and Newcastle. They were a product of the psychedelic era, but perhaps inevitably were heavily influenced by the Beatles work of the time. Despite this they were one of the most innovative groups to gain a chart presence and even today their work sounds musically inventive. Chris Kefford and Trevor Burton decided to leave the group after the first few successful singles. These included 'Flowers In The Rain' which gained notoriety for its inclusion of a picture of the Prime Minister of the day, Harold Wilson- taking a bath. The group were successfully sued and their royalties for this particular record went to charity. Despite personnel losses, and acquisition of Jeff Lynne, it was evident that Roy Wood had become the group's driving force. The hits went on into the 1970s, but by the summer of 1972 the group had evolved into the 'Electric Light Orchestra'. Wood left shortly afterwards to move his inventive musical talents to the raucous 'Wizzard'. It's not at all easy to find any of the Move's 1960s 45rpm material in a picture sleeve. There is one "EP" available on Regal Zonophone (TRZ2001), but bizarrely this runs at 33rpm- really a 7inch long player! In any event, I've resorted to showing you the sleeve from a 1984 re-release on the Dutch label 'br music', because it shows a nice photo of the band in their prime.